Manufacturer & exporter of Palais Tent. 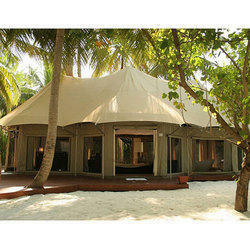 Our product range also comprises of Outdoor Tent and Cupola Tent. These Tents are easy-to-install, attractive in design and are useful as Event Tents And Wedding Tents. We offer premium quality Palais Tent to our valuable customers. Widely used for camping, these products have a capacity to accommodate a number of guests with a comfortable sitting arrangement. Our products are manufactured from optimum quality lining fabric, which is procured from trusted vendors. Further, these products are available at cost-effective market prices.